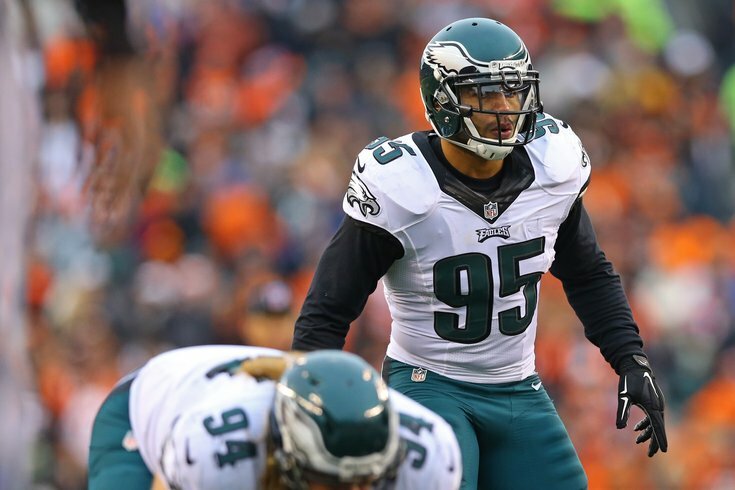 Former Philadelphia Eagles linebacker Mychal Kendricks has been hit with federal charges concerning an alleged insider trading scheme, U.S. Attorney William M. McSwain announced Wednesday morning in Center City. Kendricks, 27, was drafted by the Eagles in 2012 and spent six seasons in Philadelphia, culminating with last year's Super Bowl victory. He signed with the Cleveland Browns as a free agent this offseason. What they're saying: Should Eagles be panicking about lackluster preseason? Authorities with the FBI and the Securities and Exchange Commission detailed the charges against Kendricks and California-based consultant Damilare Sonoiki, who was also a writer for the series "Black-ish" in recent years. Between July 2014 and March 2015, Kendricks and Sonoiki allegedly conspired together to capitalize on upcoming mergers of four clients of a global investment bank in New York, where Sonoiki was a then a junior analyst. Prosecutors said Kendricks used material non-public information he received from Sonoiki to purchase call options in four companies—Compuware, Move, Sapient and Oplink. When mergers involving each of these companies were announced, the value of Kendricks' options rose significantly, according to investigators. In the case of Compuware, for example, Kendricks allegedly purchased about $60,000 in call option contracts. After the merger announcement, Kendricks allegedly sold the options for approximately $138,000, an increase of about 130 percent. 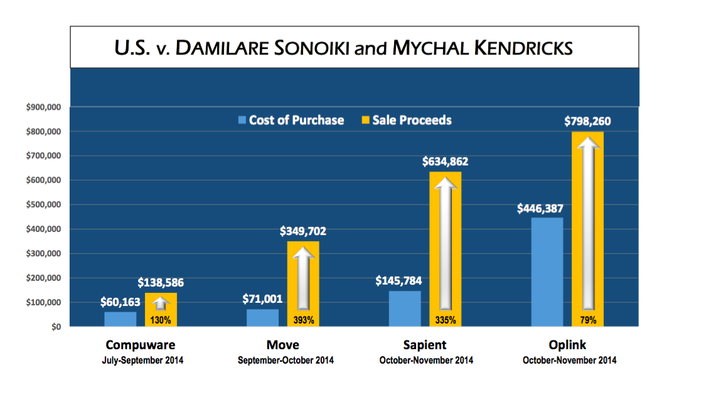 Chart of alleged profits from call options purchased by former Eagles linebacker Mychal Kendricks. Between the four companies, Kendricks allegedly made a profit of approximately $1.2 million. He allegedly provided Sonoiki with tickets to Eagles games and approximately $10,000 in cash. The linebacker released the following statement on Wednesday morning, including an apparent admission of his involvement in the scheme. I would like to apologize. Four years ago, I participated in insider trading, and I deeply regret it. Invested money with a former friend of mine who I thought I could trust and who I greatly admired. His background as a Harvard graduate and as an employee of Goldman Sachs gave me a false sense of confidence. To this point, I had worked my tail off since I was five years old to become a football player. I was drawn in by the allure of being more than just a football player. While I didn't fully understand all of the details of the illegal trades, I knew it was wrong, and I wholeheartedly regret my actions. Since the beginning of the investigation, I have fully cooperated with the authorities and will continue to do so. I accept full responsibility for my actions. Although I did not take any of the profits for myself, I am committed to repaying all of the funds gained illegally and accept the consequences of my actions. I sincerely apologize to my coaches, the owners and my teammates on the Eagles and Browns, the NFL, and the magnificent fans to whom I owe my career. I also apologize to my family, whom I have failed in this. You all deserve better, and I will work my hardest to re-earn your trust and respect, serve as an advocate to educate others, and show you that I will never be involved in anything like this again. Thank you. If convicted, Kendricks and Sonoiki each face a maximum possible sentence of 25 years’ imprisonment, a three-year period of supervised release, a $5,250,000 fine and a $200 special assessment. Forfeiture of all proceeds from the alleged offenses also may be ordered. “At the heart of insider trading cases is the concept of a level playing field,” said Christian Zajac, assistant special agent in charge of the FBI’s Philadelphia Division. “Investors bet on individual stocks, based on public knowledge of a company’s past performance and future plans. As alleged, Mychal Kendricks used material non-public information, provided by his co-defendant, to score significant profits from expected market moves. That’s not merely gaming the system—that’s a federal crime."